Miyoko Schinner is one busy woman. One might think that launching her own line of plant-based cheeses – or as she calls them, “artisanal cultured nut products,” which are made in Fairfax and are available under the Miyoko’s Kitchen label in many natural food and grocery stores near you – last year would be enough on her plate, but no. The longtime vegan has just released “The Homemade Vegan Pantry: The Art of Making Your Own Staples” with a foreword from Isa Chandra Moskowitz (Ten Speed Press), her fourth cookbook. 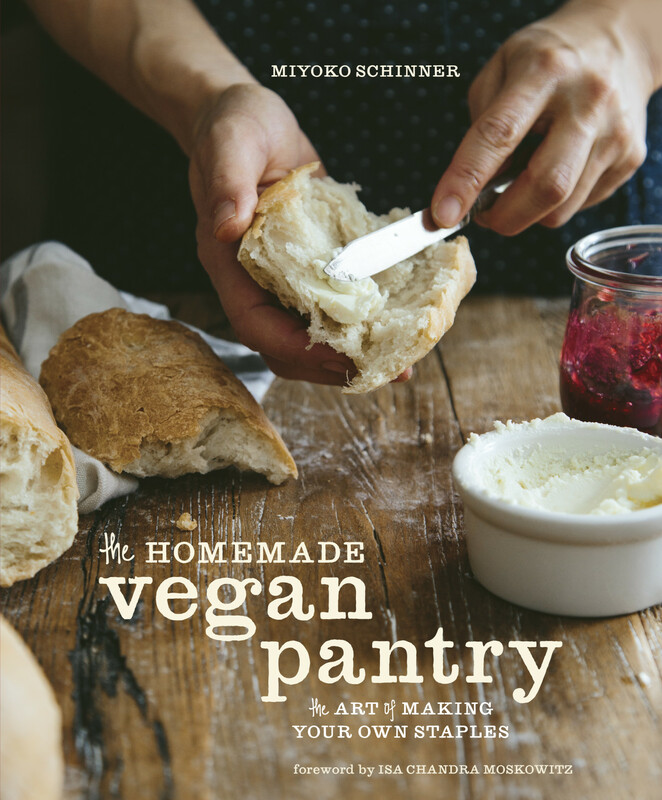 Schinner wrote this book because, as she says in its introduction, vegans are no different than everyone else in that they sometimes rely on heavily-processed products to save time. Figuring out how to feed one’s family daily can be quite a chore, she says, and as her family grew and life became more complicated, she too became more reliant on such packaged and pre-made products. “While all of this seemed to make my life easier, Mother Nature wasn’t smiling down on me on garbage night as our family’s mountain of packaging waste grew, nor did it help our pocketbook, our health, or our enjoyment of the taste and flavors of food,” she writes. Over time, she began experimenting with making her own soy yogurt, then vegan mayonnaise and bread. Then she moved on to soymilk and other pantry staples. She learned that an investment of time on the weekend making such staples worked wonders to improve the quality of her family’s weeknight dinners by having such items already in the pantry or refrigerator. Not only did she produce so much less waste, but she was saving money, too. By her accounting, half a gallon of soymilk costs around $4. The soybeans required to make the same amount: 50 cents at most. Vegan mayonnaise also runs around $4. But a bit of oil, homemade soymilk, garlic and a few spices can knock the price down to half that, if not even more. Furthermore, Schinner gives tips on how to stretch your dollars even further by using vegetable bits that might otherwise end up in the compost. For example, she advises that after making mushroom stock, you can take the mushrooms, carrots and onions that have given over their flavor to the stock, and with the addition of walnuts, herbs and spices, they can be turned into a mushroom pâté. She also takes the skins that come from cooking down tomatoes and turns them into a pesto that can be used to enhance soups and sandwiches. (While finding uses for vegetables from stock is not a new concept, I certainly give Schinner credit for thinking up a use for tomato skins, though quite a large volume of them is needed to make said pesto). And this one was also completely new to me: okara, which is the fibrous byproduct leftover from making your own soymilk, has a flaky texture that Schinner says is the perfect base for her recipes for San Francisco Fab Cakes (in lieu of crab cakes), Gold Nuggets (a stand-in for the more popular chicken) or UnFish Sticks (no explanation necessary). While all of this sounds good in theory, I wonder how many people – vegans or not – will be inspired to make their own tofu from their homemade soymilk (though it can just as easily be made from store-bought soymilk.) While Schinner goes on at length about how delicious homemade tofu can be in comparison, making your own requires magnesium chloride and cooking the soymilk until it coagulates in a process that mirrors making your own cheese. Of course, there are plenty of people now making their own cheese and therefore tofu isn’t any harder, except for the extra step to make your own soymilk first, but your average person looking to save time is probably going to just buy the pre-made versions. The book really does cover all kinds of pantry items, however, from salad dressings and condiments to cheeses to muffin and pancake mixes and meat substitutes. 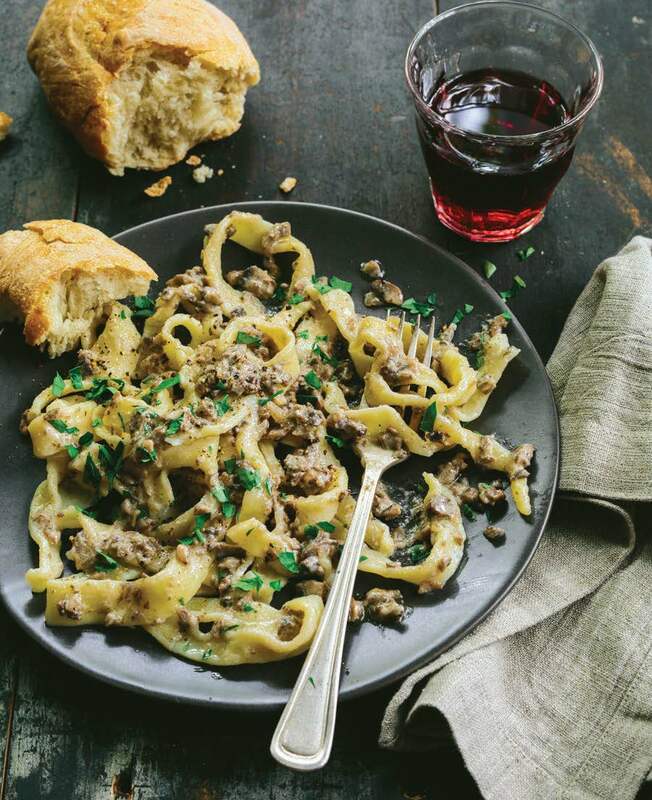 One recipe that jumped out at me wasn’t for a pantry item, but for an Umbrian Tartufo Sauce – a pasta sauce made from mushrooms that Schinner tried in Italy some years ago. While the version she ate in Italy was oil-based, she replaces that with cashew cream, which is made by blending cashews and water in a blender to give the sauce some creaminess (no need to soak the cashews, unless you have a very weak blender). Mushrooms, shallots and quite a lot of garlic are sautéed in a bit of oil first. The cashew cream is added later, along with a bit of truffle oil, and then eaten over pasta. It was rich, it was satisfying, and the fact that it was vegan didn’t even come up; we thoroughly enjoyed it, and would definitely make it again. I also tried Schinners’ recipe for what she calls “The Real Burger,” or the “Now and Zen” burgers, named after the vegan bistro she once ran in San Francisco. “I get more requests from omnivores for this burger than for just about anything else,” she writes, and I have to say after eating several of them, I can see why. The recipe makes 18 large burgers, which makes it easy to justify the time, since they freeze well, and taking one out of the freezer to grill for vegetarian guests at a barbecue will certainly be so much more impressive than reaching for the cardboard box of veggie burgers. Vital wheat gluten is one of the secret ingredients, and is what makes the texture of these burgers so good. They not only stick together well, but they are chewy in a way that most veggie burgers aren’t. My husband and I both thought these were some of the most successful veggie burgers we had ever had, both in terms of their flavor (most of it comes from mushrooms and onions, but tomato paste and miso and a number of spices are in there, too) and texture, though obviously they won’t work for gluten-free folks. I also brought some to a barbecue, and several non-vegans who tried them remarked they may be the best veggie burger they ever had. Since there are so many recipes for condiments included, I thought I should give one of those a try as well, and chose a ranch dressing. Like many of the condiments, it has a cashew base, and then is doctored up with some lemon, garlic, onion, mustard and spices. While this made a fine vegan salad dressing, we didn’t think it tasted particularly like the ranch it was aiming for, mostly in that it was missing the tanginess. Vegan cooking is trying to save the world, as Isa Chandra Moskowitz says in the book’s foreword. But in so doing, it needs to be tasty enough so omnivores like it too. Based on the recipes we tried, this book is meaty enough – forgive the pun – that omnivores looking to lessen their meat consumption will have plenty to chew on, and for vegans, well, it’s a slam-dunk. In a large skillet over medium-high heat, heat the oil. Add the shallot and sauté until tender. For oil-free cooking, simply sauté the shallot with a dash of water. Add the garlic and mushrooms and sauté for 5 to 10 minutes, until the mushrooms are browned and moist but not wet looking. Add the truffle oil and cashew cream and stir well. Cook for 1 minute to let the sauce thicken, then season with salt and pepper. Toss with hot spaghetti, garnish with some chopped parsley, and serve immediately. Best enjoyed when freshly made; leftovers can be stored in a covered container in the refrigerator for 2 or 3 days. Do not freeze, or it will change the texture. Place the water and cashews in a blender and blend until smooth and creamy, about 1 minute. That’s it! The cream keeps in the refrigerator for 1 to 3 days. 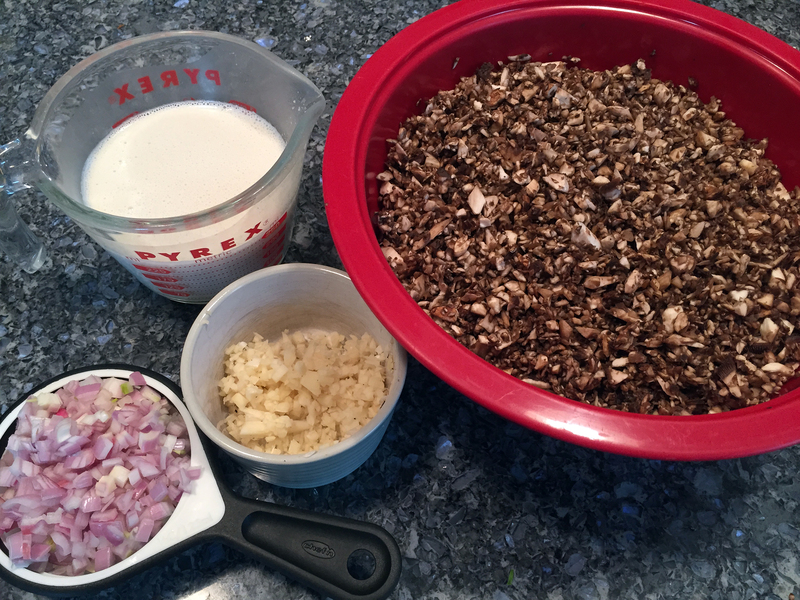 Pulse the mushrooms in batches in the food processor until minced but not mushy. Transfer them to a large bowl, then mix in the onions, rice, tomato paste, parsley, soy sauce, miso, and herbs and spices. Mixing is most easily done with your hands. When everything is well incorporated, add the wheat gluten and mix well. Use a large ice cream scoop to form balls, drop them onto the prepared baking sheets, then flatten with your hand to form patties. Find a large, deep lid for a jar, like ones often used for giant jars of peanut butter. Line it with plastic wrap. Pack in the burger mixture, then flip it out onto the prepared baking sheets (you can keep reusing the same sheet of plastic wrap). This method makes perfectly shaped burgers like the kind that come out of a box. Fool your kids with this method if they tend to clamor for “bought” goods. Bake for about 30 minutes, until firm to the touch. Refrigerate or freeze until use. Refrigerate for a week or so or freeze for 6 to 8 months. You can reheat them in a skillet with a little oil, throw them on the grill, or pop them back in the oven. For serving, the usual mustard and ketchup work fine, but I prefer these with some sautéed onions and a sweet Dijon sauce. To create the sauce, in a small bowl, mix together the mustard and 3 tablespoons syrup (or more, depending on how sweet you like your condiments) and set aside. In a sauté pan, sauté the sliced onion in a little oil over medium-high heat until browned. 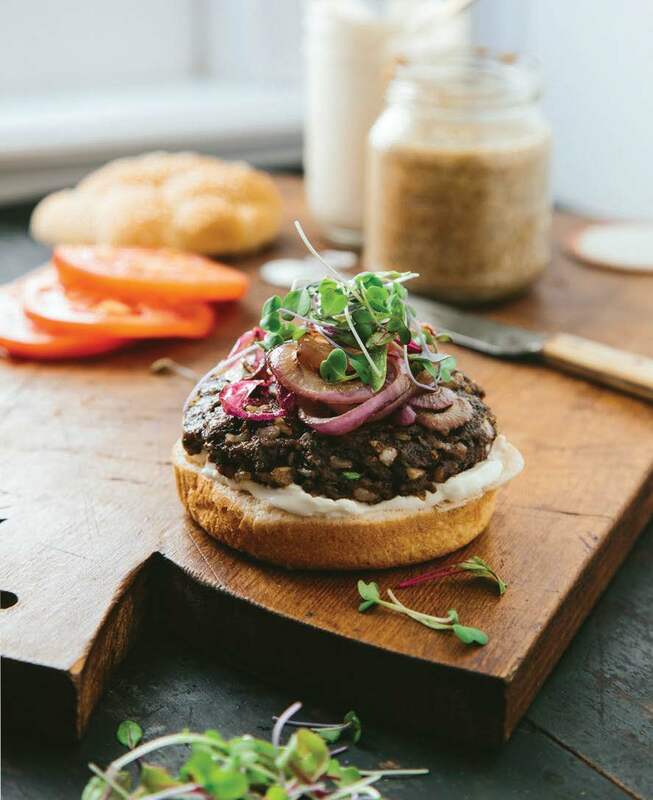 Spread burger buns with vegan mayo, place a hot burger patty on the bun, and top with a generous helping of the onions and sweet Dijon sauce. If you like, throw on some lettuce and tomatoes, too. Recipes reprinted from THE HOMEMADE VEGAN PANTRY Copyright © 2015 by Miyoko Schinner. Photographs © 2015 by Eva Kolenko. Published by Ten Speed Press, an imprint of Penguin Random House LLC.